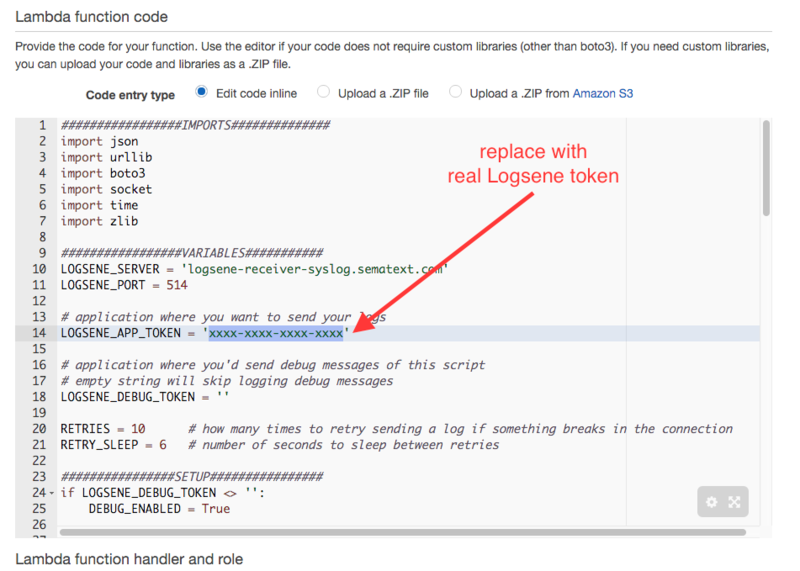 This recipe shows how to send CloudTrail logs (which are .gz logs that AWS puts in a certain S3 bucket) to a Logsene application, but should apply to any kinds of logs that you put into S3. 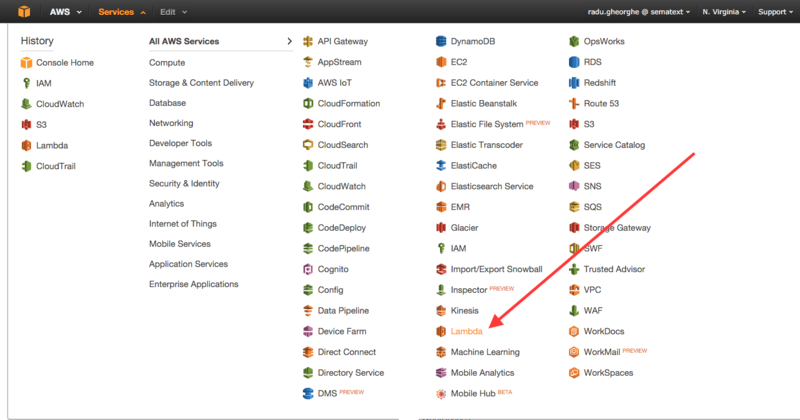 We’ll use AWS Lambda for this, but you don’t have to write the code. We’ve got that covered. From there you’d start creating a function. If you don’t have another function, you’d just click on Get Started Now and it gets you there. Then the first step is to select a blueprint for your function. Take s3-get-object-python. The next step is to select a source. Here you’d make sure the source type is S3, select the bucket to fetch logs from and pick Object Created (All) as the event type. This will make the function run whenever a new object is created in that bucket. To find the Logsene Application Token, go to your Sematext Account, then in the Services menu select Logsene, and then the Logsene application you want to send your logs to. Once you’re in that application, click the Integration button and you’ll see the application token. After the code, leave the handler to the default lambda_function.lambda_handler and select a role that allows this function to access the S3 bucket in order to fetch logs. If you don’t have one already, select S3 execution role from the dropdown, and you’ll be redirected to the IAM window, where you can accept the provided values and return. Finally, you need to decide on how much memory you allow for the function and how long you allow it to run. This will influence costs (i.e. like keeping the equivalent general-purpose instance up for that time). Normally, runtime is very short (sub-second) so even large resources shouldn’t generate significant costs. The default 128MB of RAM should be enough to load typical CloudTrail logs, which are small. You’d need more memory if you upload larger logs. As for timeout, selecting 4-5 minutes should be enough to give some resiliency in case of a network issue (i.e. allow the function to retry – which can be configured in the function code). To enable the function to run when a new object is put, you’d need to enable the source at the last step.